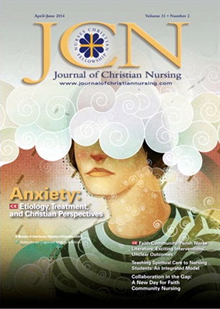 Kathy’s personal interest in learning how to deal with anxiety arose from publishing the feature article, “Anxiety: Etiology, Treatment, and Christian Perspectives,” in the Journal of Christian Nursing, April-June 2014. Anxiety is a normal response to stress and danger but it can become excessive and uncontrollable for some people. Anxiety disorders are the most common mental illness in the United States, affecting 18% or more adults. As nurses, it is important to learn more about pathophysiology and treatment of anxiety, including nursing and Christian perspectives that can help. “As Christians, how might we better identify and manage anxiety?” Kathy asks. See her JCN editorial about how to become aware of God’s calming presence in the midst of anxious moments. You can receive every issue of the peer-reviewed Journal of Christian Nursing by becoming a member of NCF, along with other member benefits. Or, subscribe to JCN. Perfect time, I am adventuring into a new career venture. There is a potential for high anxiety. Thank you.